When things get really tight in my life I start to fall back on old bad habits, the kind that die hard. Why is that? Why do I not fall back on the old good habits? So, partly based on work we did in coven last night, partly based on self-reflection surrounding what’s in my head recently and how it’s moving in relation to some stressful pieces of my life I made a change. I actively consciously chose to revisit old good habits. 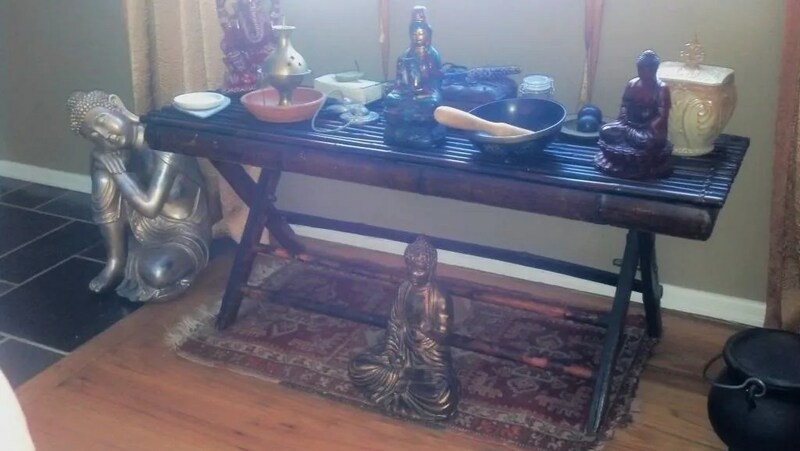 For me that was spending time with my Kuan Yin altar and getting my zen on. Nothing brings me back to the person I most like to be than Kuan Yin, how and when she showed up for me, and what she represents. And here is a quick not so great photo of my altar. Poor Ganesh got his head chopped off by the crappy photographer. This entry was originally posted at http://pj.dreamwidth.org/370895.html. Please comment here or there there using your LJ ID or OpenID.